3Commas is one of the most complete cryptocurrency trading tools available on the market. If you are thinking about investing or trading cryptocurrencies, then, 3Commas will assist you in order to minimize the risks and maximize your profits. If you do not know how to start trading, or you don’t feel confident enough, 3Commas will definitely help you. The platform launched in December 2017 will help you if you are a new user. When you register in 3Commas as a new user you have a welcome bonus of $10. Once you are registered, you will be able to trade in the most important cryptocurrency exchanges (Bittrex, Bitfinex, Binance, Kucoin and Poloniex are supported). 3Commas connects with your favourite cryptocurrency exchange using the API. But don’t worry! Your funds are safe. When you set up an API key, you need to disable withdrawals. In this way, 3Commas would not be able to withdraw your funds and will only be able to perform trading actions. When you have already established a connection between your cryptocurrency exchange and 3Commas, you will have the possibility to trade with all the tools provided by the company. If you want an additional layer of security, 3Commas offers the possibility to set up a 2 factor authentication code as many other cryptocurrency exchanges, wallets and platforms in the market. One of the most important features available on 3Commas is the SmartTrading feature. With SmartTrading, investors are able to use the TakeProfit and StopLoss tools. This option is available simultaneously on multiple cryptocurrency exchanges. That would allow the trader to maximize the profits by customizing the portfolio with different commands to buy or sell at certain prices. Investors set up a Stop Loss when the price falls below the price set. If you bought 1 ETH for $100 and Set Stop Loss of -10% then, if ETH reaches $90, the Stop Loss automatically sells the ETH on the market. If you use the Take Profit tool, it works in a similar way than the Stop Loss. If you bought 1 ETH for $100 and you set Take Profit of 10% then, when ETH reaches $110, the system automatically closes the trade for you. The most popular tools are Trailing Stop Loss and Trailing Take Profit. This allows you to maximize profits and minimize loses but always following the same initial strategy. That’s a very useful tool that most trading platforms do not offer. In general, other cryptocurrency exchanges are only able to provide the user with stop loss or take profit. 3Commas has decided to improve that system by including the Trailing Stop Loss and the Trailing Take Profit. Another important tool that 3Commas has are portfolios. 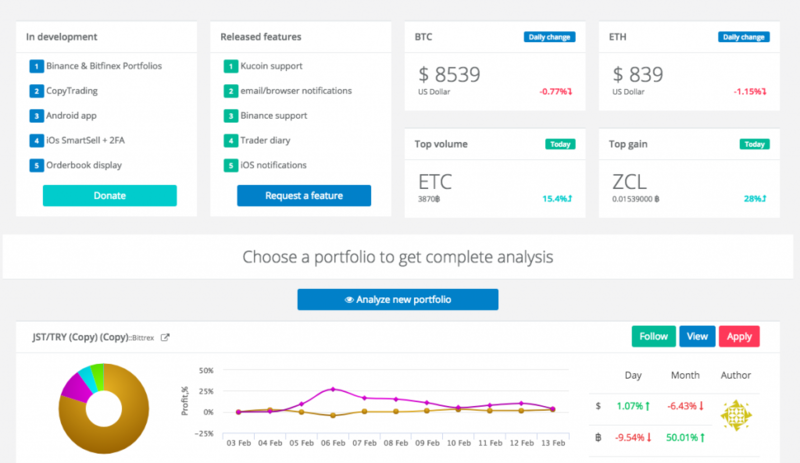 With these portfolios, you can choose a variety of cryptocurrencies to hold or follow. This works in a similar way as ETFs. You can invest in a portfolio previously created by another user or you can create your own portfolio using different virtual currencies. 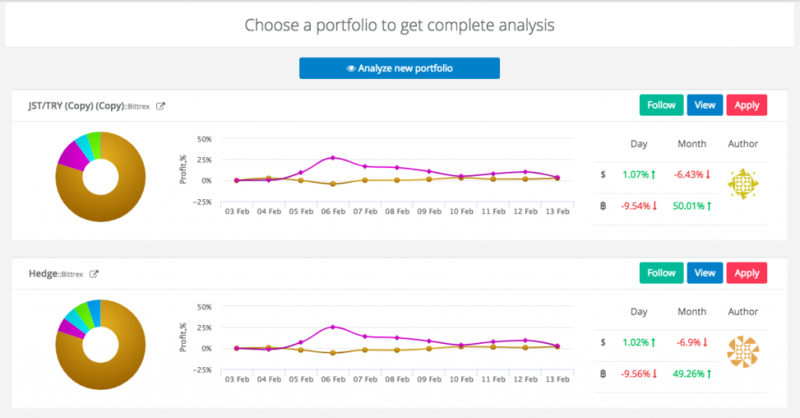 If you are an investor, portfolios can help you to diversify the assets you own and mix them with more profitable ones. You can follow these portfolios and take similar strategies to them or simply by them directly on the platform. 3Commas offers a multilevel referral program that consist of three levels. If you refer another investor with your referral link, you will receive 7% of his deposits. If this referral invites a new user, then you will receive 2% of his deposits. And if the second referral adds a new user to the platform, you will receive 1% of his deposits on your account. 3Commas is a user-friendly investment platform that allows individuals and investors to maximize trading benefits and reduce trading loses. With the variety of tools provided by the platform, the investor will be able to try the best trading strategies reducing the inherent risk of trading with volatile cryptocurrencies. The recently launched platform will help traders with their investment strategies maximizing their profits. Besides that, for traders that need to be connected all the time with their investments, 3Commas offers an iOS application that can be downloaded from the App Store for Free.